Today’s blog complements Isabelle’s great blog from last week detailing July sales in Coconut Grove. Not only was July a notable month, but 2011 figures show that Coconut Grove has had a remarkable year. 33 properties priced at $1 million dollars and over were sold in the last 6 months in Coconut Grove, representing 27.5% of the 120 single family homes sold during the period. Congratulations Grovites! These figures represent an increase of 43% compared to the same period in 2010, when we saw only 23 properties sold for $1 million or more in Coconut Grove. The top priced homes also show a great improvement. This year the most expensive property in Coconut Grove sold for $13,419,495. This is quite high compared to last year’s most expensive home sold at $6,750,000. 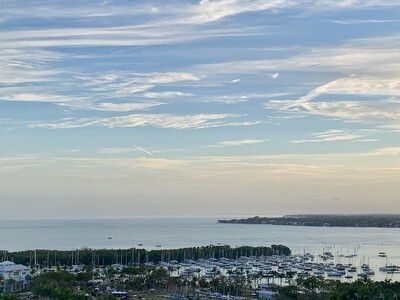 To see a detailed list of great properties for sale in Coconut Grove, visit www.groveexperts.com or call us for a private showing of one of these trophy properties. Isabelle and I will be delighted to help you discover “our” wonderful Coconut Grove. Alba and I always go to "Broker's Opens" to preview the new properties on the market. We do this often because knowing the property inventory helps us better advise our our buyers and sellers. On our way to one of these Opens last Wednesday, we had one of those moments that reminds us of just how lucky we are to live in such beautiful city! The rainy season is upon us. We love it! Our Coconut Grove tree canopy will be a vibrant green and lush. This picture was taken at the Coral Gables waterway. The luxury real estate market features homes priced over $1,000,000. In the month of July, Coconut Grove saw a total of 19 single family homes sold. Eight of those properties sold for more than $1,000,000, representing an impressive 42% of total sales. 2457 South Bayshore Dr: 3 bedrooms/4 baths with 3,143 Sq/Ft of living space. Sold Price: $1,125,000. If you are interested in exceptional properties in Coconut Grove, please contact us. 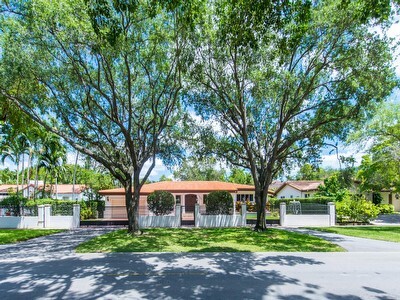 Nestled in South Grove, one of Miami's most beautiful and luxurious areas, is the property at 3779 Loquat Avenue. A new construction built in 2005, this grand home offers 5 bedrooms and 4.5 bathrooms. Those with families will find this property especially attractive as it is within walking distance of G. W. Carver Middle School, an International Middle School with programs in Spanish, French, German and Italian. Imagine yourself driving home, comforted by the fact that your house is located only a few minutes from the downtown office district, Miami International Airport, and South Beach. You open the front door and a luminous foyer welcomes you after a hard day of work. Warm blonde wood floors invite you to stay. 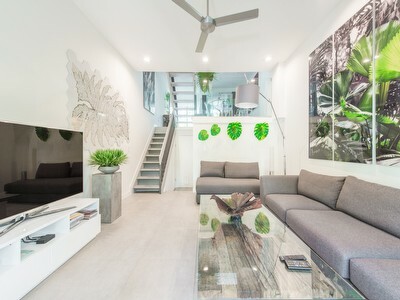 The first floor of your home offers 3.5 bathrooms, 1 master bedroom, and 2 regular bedrooms as communicating suites (perfect if you have in-laws, or to use as an office, nursery, artist atelier, or as a personal gym). The second floor has 2 bedrooms, 1 bath, and a large terrace overlooking the beautiful grounds. Of course there is a working fireplace! As of August 5th, 2011 there are 169 singles family homes for sale in Coconut Grove. The highest asking price is $12,000,000 for a property located at 3316 Devon Court is South Grove. The lowest asking price is $59,900 for a property located at 3639 William Avenue in West Grove. Coconut Grove has 4 neighborhoods: North Grove, Center Grove, South Grove and West Grove. West Grove has its own real estate dynamic and the values are much lower than the rest of Coconut Grove. 22 properties are currently for sale in South Grove. That represents 13% of all the properties for sale in Coconut Grove. The asking prices range from $59,900 to $341,000. If you are interested in the opportunities that the West Grove offers, please contact us. Only one condo sale over one million dollars was closed in July 2011 in Coconut Grove. The unit #1404 at the Grovernor House at 2627 South Bayshore Drive closed for $1,625,000 on 07/29/11. It was listed with Fortune International Realty and it offered 3 bedrooms, 3 1/2 baths, 2,640 Sq/Ft of living space. The unitfeatured spectacular views of Biscayne Bay. Five units sold at the Mutiny in July 2011. The Mutiny is a condo hotel located at 2951 South Bayshore Drive. Unit #302 is a 2 bed / 2 baths with 1,100 Sq/Ft of living space. It sold for $270,000. Unit #908 is a 2 bed / 2 Baths with 980 Sq/Ft of living space. It sold for $220,370. Unit #1104 is a 1 bed /1 bath with 740 Sq/Ft of living space. It sold for $195,000. Unit #911 is a 1 bed /1 bath with 620 Sq/Ft of living space. It sold for $150,000. Unit #650 is a 1 bed/ 1 bath with 650 Sq/ft of living space. It sold for $105,000. There are 13 units for sale at the Mutiny as of August 1, 2011. If you would like to preview them, please contact us.